My whole photographic life is regulated by a photographic image rating system. While I download original photographs from the memory card I immediately start to rate the previous session’s images.The rated images are transferred to a “To Edit” folder. Images in the “To Edit “ folder that are edited will end up in a “Edited” folder and might see the light of day as a Facebook or Blog post, maybe a magazine article or even a book every now and then. I only archive edited image and will never send an image into the “virtual” or printed world in any format that I did not throw the kitchen zink at in terms of editing. So when I had to revisit an Etosha/ Namibia “To Edit” folder of a few year ago I took a long hard look at photographs that were never edited and asked myself why not ? Were they rated to low to start with and will I now rerate that image higher or for that matter lower ? Some of the images were rated low and then there were other that were rated higher by never used. Some were part of a sequence and the potential most likely the perceived better ones were used. Then again there were many sequences where no worthwhile images were edited? Why not? Although I am a conservative photographer when it come to pressing the shutter release I think the simple answer to this is that we just shoot way to many images, never have time to edit all of the use full one and that those photographs if not deleted will never be used. So what to do about those images. 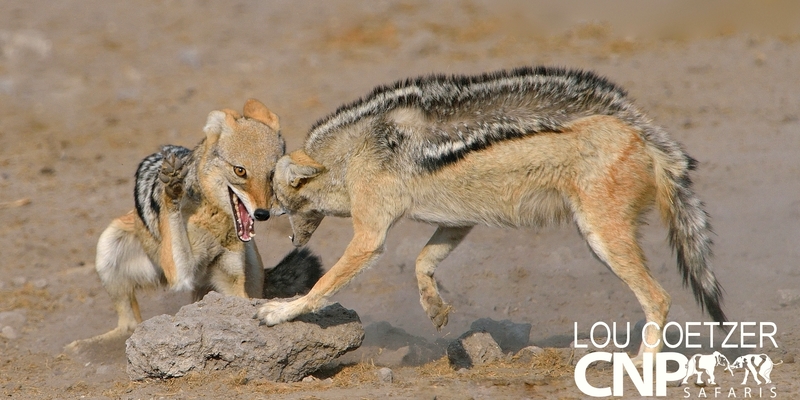 Territorial Dominance – The biggest Black-backed Jackal territorial male that I have ever seen make sure that a lesser male that flirted with some females gets the message. 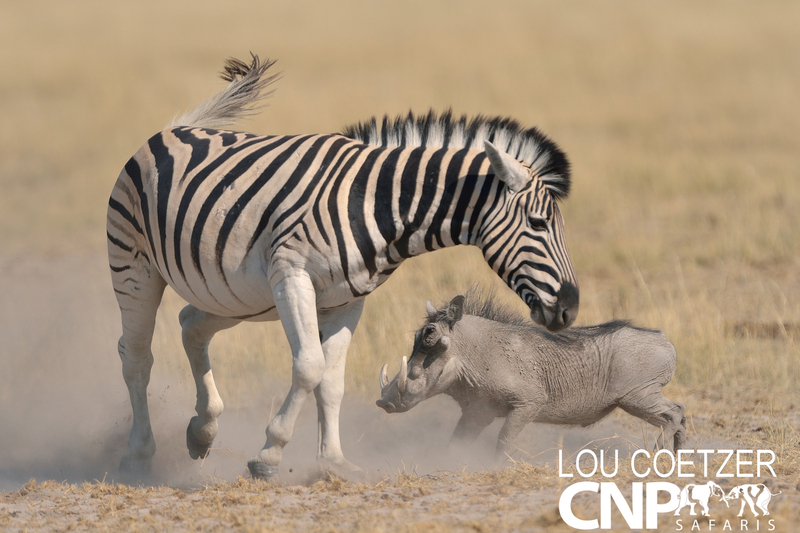 Unusual Confrontation – A Zebra stallion broke up a territorial fight between Warthogs and here the one Warthog turns his aggression on the stallion. Now how do you script that! 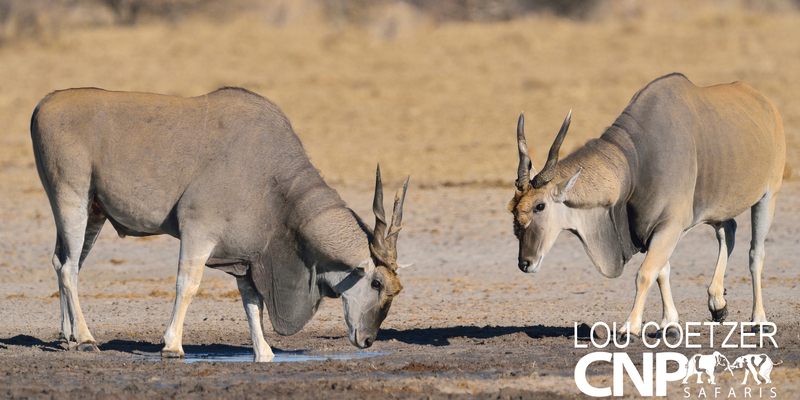 Eland Bulls – Just not enough action for a serious rating but how many photographs do you have of big Eland Bulls that are not running away, against a clean background giving each other the nod. 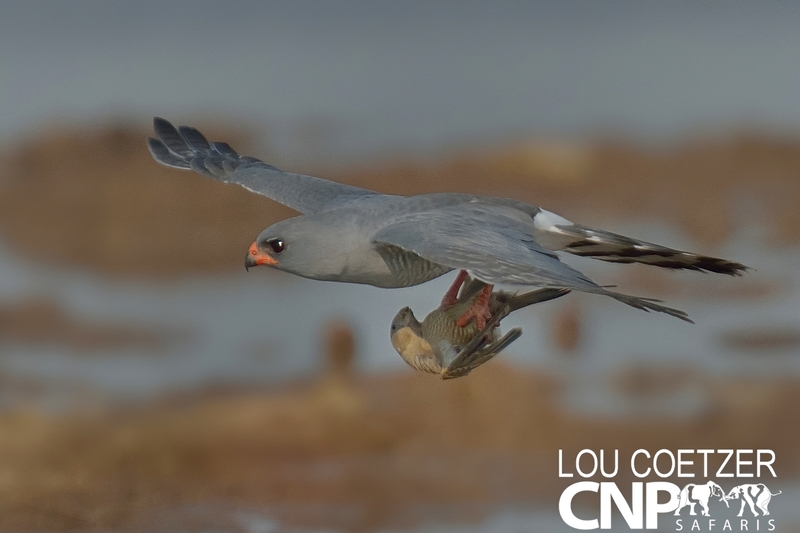 Gabar Goshawk with prey – Just after sunrise Red-billed Quelea will visit Etosha waterholes in their thousands to drink. Before they arrive small birds of prey like Gabar Goshawks will place themselves with the rising sun and wait. Although the Goshawks attack with lightning speed they sometimes need a few strikes to nail their daily meal. 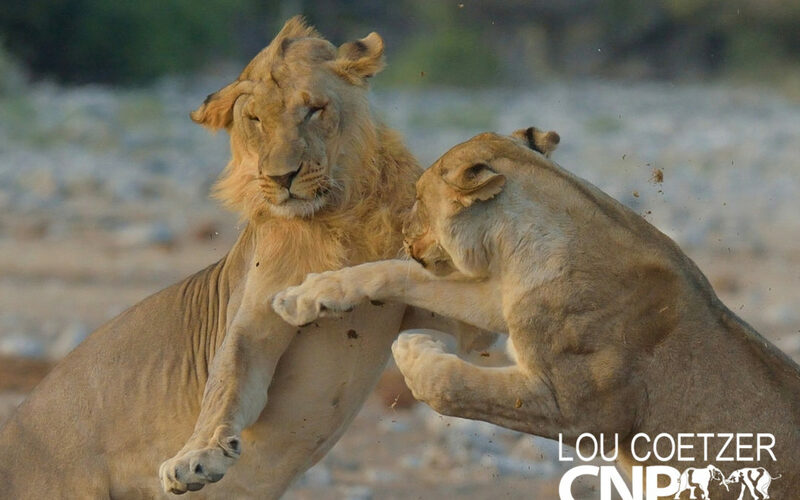 Take that brother – A playful young lioness smacks her brother – because she can! 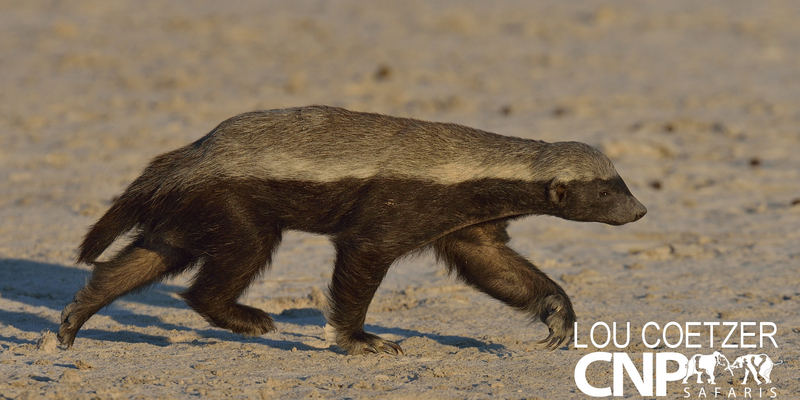 Honey Badger Exposed – I worked very hard to photograph this Honey Badger working his way at the edge of Fisher Pan. Patience paid of and I eventually got a clean well lit shot. 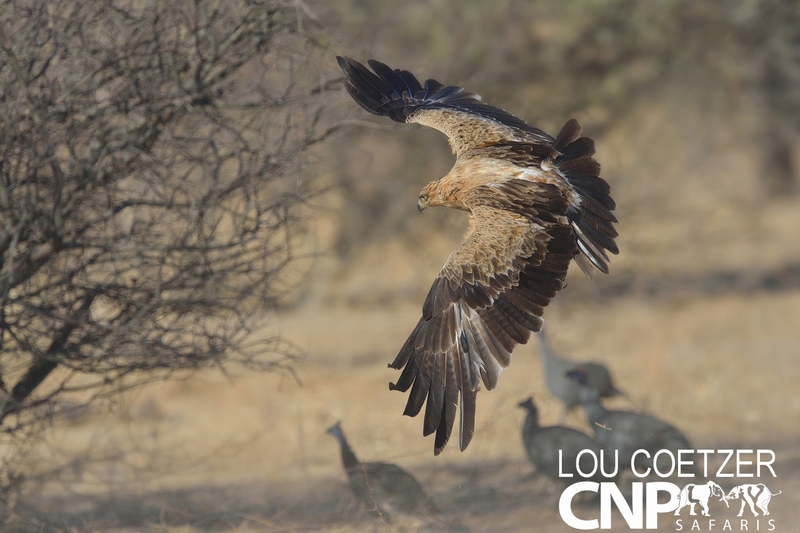 So more emotion than photographic substance but a great time with a very special animal.